On January 28th, the One-Day "English Class" Elementary School Volunteer Program was held at Shiomi Elementary School in Bunkyo Ward. Thirteen international students joined the English classes of 6th grade students and helped them practice their English. During the classes, the elementary school students used English phrases they learned in their lessons to talk with the international students about their future dreams. In the second half of the classes, many students asked the international students questions about their future dreams, favorite Japanese foods, and so on. After the classes, the international students and 4th-6th grade students enjoyed a school lunch together. 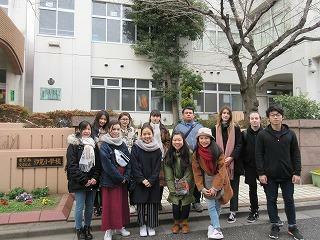 The international students who participated said the Shiomi Elementary School students spoke English very actively, their manners were wonderful, and it was an amazing experience. Thanks to the Shiomi students and their delightful smiles, this was a truly memorable day for the international students.